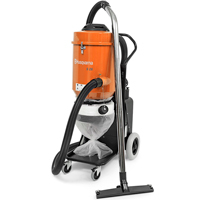 S26 is a powerful single-phase HEPA dust extractor to match the grinding machines Husqvarna PG 280, PG 450 and early entry saw Soff-Cut 150. It also matches small scarifiers and shot blasters as well as handheld power tools. 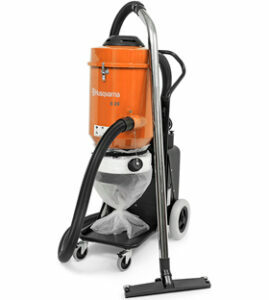 This professional dust extractor is suitable for building, grinding, plaster and concrete dust. Equipped with two tested and certified HEPA H13 filters. Features include Jet Pulse pre-filter cleaning, hour counter and vacuum meter for filter control. The non-marking wheels are puncture free and lock at the front. The Longopac bag hose system ensures simple, dust-free bag changes. Efficient filtration system – The three separate filtering stages result in longer working time between filter cleaning. The dust is filtered through a cyclone chamber, which separate the heaviest parts, up to 95% of the dust, before the washable main filter. The HEPA micro filters are individual tested and certified to capture 99.99% of the remaining silivia dust in the respirable fraction (0.3µm). Easy and efficient filter cleaning – The Jet Pulse filter cleaning system ensures high continuous airflow thanks to easy and efficient cleaning of the conical main filter without opening the machine. Durable design – Corrosion-resistant steel clamps, welded frame with dust bag platform and durable steel handle make it ready to serve for many years. Easy to transport – The welded frame enables easy transportation by resting the machine on the frame.